Congratulations! 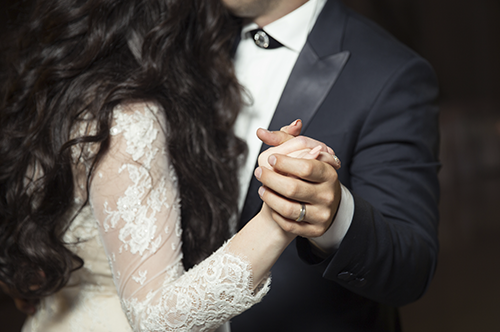 The wedding day is going to be magical no matter what you have planned, but we’re pretty positive that a custom song written just for you is going to be the best cherry on top of your big day. Everything about your wedding is personalized to you, so to help make the song just as perfect, we’ve collected a few sample questions, a couple of our favorite Wedding song examples, and some story submissions we’ve received in the past to give you an idea of what others submit. I want to give MY FIANCE a song for THE MORNING OF OUR WEDDING that will make HER FEEL SPECIAL AND LOVED. Alyssa and I met when she was a sophomore in college. She was a nursing student and I was a new nurse at the University of Iowa Hospitals and clinics. Immediately she caught my eye but she being my student it took us an additional year and a half to go on our first date. Though at the time neither of us were ready for a relationship we continued to talk off and on for 2 years. One night, we ran into each other when we were both out with our friends. Again we started talking and began dating in Aug of 2014. In Aug 2016 I proposed to the love my life. After a dinner at one of our favorite restaurants we took a walk along the river landing across the bridge. All along the bridge were chalk drawings of our time together. However, it was not until we got to one of the viewing platforms over the river did she realize what was going on. On the platform were additional chalk drawings including our first date, first kiss, and lyrics to one of our favorite songs. She is the most incredible woman I know. She pushes to make me better and I have never felt this way about anyone. We can sit inside and do nothing and it's better than going out with my friends. Everything is just better with her and I want her to know on our wedding day how much she means to me. I can't wait to spend the rest of my life with her and I hope she knows that I love her with everything I have. I want to give MY SOON TO BE HUSBAND a song for OUR FIRST DANCE that will make HIM CRY HAPPY TEARS. We met at Penn State at a party house. We were friends for a few months until one night we were the last ones up at the party, and stayed up talking for a while, and eventually kissed for the first time. I drove him home for Easter break, where we got to know each other more (mostly talking about sports because I wanted to impress him). When we got back to school, we started hanging out a lot more. But then summer was around the corner, and we didn't make things exclusive or official. That summer apart was hard, and we didn't really know what we were. But then halfway through Summer, he called me and said he only wanted to be with me. That made me so happy, and I couldn't wait to get back to school in the Fall to see him! We've been together ever since; doing long-distance for almost three years, and then once I graduated, he moved up to Massachusetts just for me! We started our life here, first in our one-bedroom apartment in North Attleboro, MA - and then we bought our first home together in Shrewsbury, MA. We've had many adventures together, from attending every Philadelphia vs. Boston sporting event to vacationing in Cancun, Mexico and seeing road-tripping to Niagara Falls. Some of our favorite memories come from tailgating at Penn State football games. We often go back to Bethlehem to visit his parents and see old friends, and one weekend he took me to my favorite place as a kid - the Moravian Bookstore on Main St Bethlehem. It was there that he proposed :) It was so thoughtful that he thought of such a mutually-important place to us both, one that had so many memories for me as a kid, but also symbolized our new life together and how our story has really come full circle. After I said YES, we got in the car and drove 3 hours to Penn State (where it all began) and went to a football game. It was so typical that that game was a torrential downpour, and we were so unprepared that we didn't have ponchos, we had to use trash bags from the tailgating fields! We love watching every movie in Red Box available, attending sporting events, eating Mexican food (tacos and enchiladas), and I'm a little overly-obsessed with holding hands. Ben is such a fun-loving, caring person who I know would do anything for me, including throwing all of his possessions (including his cat, Felix) in the back of his silver Volkswagon Beetle and moving to Massachusetts with no job, no friends, just for me! I can't wait to have more adventures and grow old together.